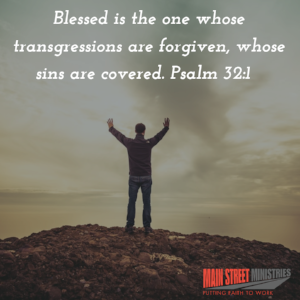 David knew what it was like to sin and yet find forgiveness for he knew the blessing which flowed from God’s mercy. He experienced firsthand the weight and pressure of unconfessed sin in his life. When sin is left unattended, it stays on our mind, and the guilt seems to follow us around. David knew this pain all too well. One of the many blessings God gives us is forgiveness. Jesus provided the way for us to receive forgiveness and for the guilt of our sin to be released. It is a blessing to receive this gift of mercy, and there is nothing more we need to do other than confess our sin to God. So why do we often carry sin around? Could it be we try to earn or wait until we somehow feel we deserve forgiveness? Maybe we have numbed it by denying our sin, only to find it ticking away at us day by day. We can soon find relief from sin by confessing or admitting we have sinned and then accepting His forgiveness. We can experience the guilt and shame being disarmed and see the blessings flow. Forgiveness releases us from walking the daily road of shame and disgrace and doing a U-Turn to the route of blessings. Will, we uncover our sin and allow Jesus to cover it with His shed blood? The new KCWN website is finally here!